Whether through design, or incompetence, a beneficial interest held by Prime Minister O’Neill in a company receiving government contracts has been hidden from the public for over five years. This has occurred as a result of executive actions that would appear to breach the Companies Act 1997. At the centre of this affair is Graphos Limited, a company which publicly trades under the name Biz Print. Biz Print contracts with a range of state entities including, Air Niugini, the Mineral Resource Authority and Post PNG. Up until 2016, the Company Registry maintained by the Investment Promotion Authority (IPA), listed Graphos Limited’s owners as Australian national, Brian Rice (80%), and PNG national, Joe Naipu (20%). However, according to internal Graphos records, the company had in fact been acquired five years earlier by Remington Technology Limited, on 8 May 2010. The majority owner of Remington Technology Limited, is Peter O’Neill (through LBJ Investments), he is also a Remington Director. Document: Board minutes signed on 21/05/2010, which record the 8/05/2010 sale. Under Section 65 of the Companies Act 1997, once shares are transferred in a company, it is incumbent on the entity concerned to submit notice to the Registrar (IPA) in the prescribed form. Failure to do so is an offence under Sections 413(1) and 414(1), for which the directors and company are liable. 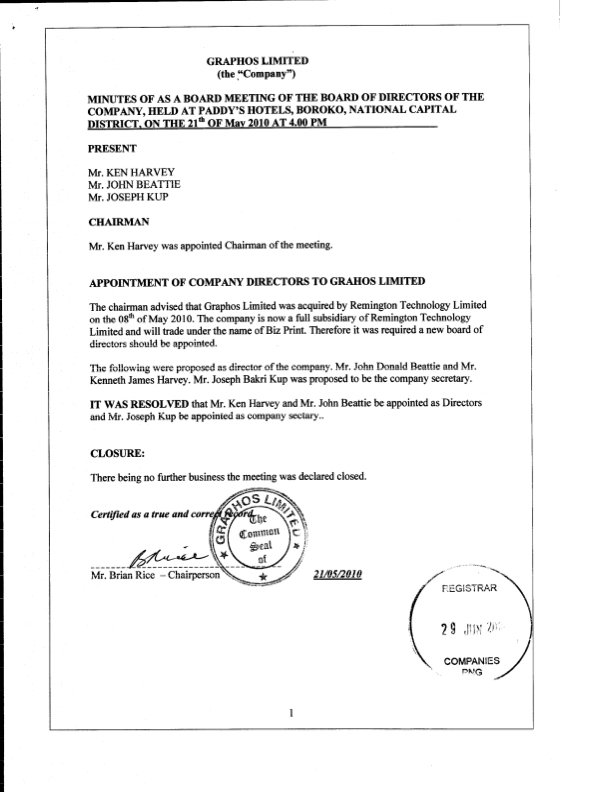 Despite the fact internal records indicate Graphos Limited was sold to Remington Technology Limited on 8 May 2010, the company did not complete a share transfer form (see document below) until 19 October 2015. The registrar’s stamp on the submission is dated 29 June 2016. This, in effect, means for a 5+ year period, anyone conducting due diligence on Graphos Limited using the public register, would have been given the false impression that the firm was owned by Brian Rice and Joe Naipu rather than the Prime Minister, Peter O’Neill. In practice, O’Neill’s beneficial interest was hidden from the public. We ought not to forget in this respect, that during the National Provident Fund Commission of Inquiry, Rtd Judge Tos Barnett concluded that Peter O’Neill was using proxy shareholders to hide his interest in companies, that were allegedly involved in a range of illegal transactions with state owned entities. However, it is not yet clear whether in the case of Graphos Limited, this concealment of the Prime Minister’s interest was a matter of design or incompetence. The story does not end there though. The Companies Act 1997 also requires that when there is a change in director, the registrar must be notified within one month. Failure to do so is an offence under s414(2), to which every director is liable. A similar stipulation is set out when there is a change of secretary under s170. According to signed Graphos Board minutes (see above), three individuals were appointed to executive positions in the company through a motion passed on 21 May 2010. Mr John Donald Beattie, and Mr Kenneth James Havery, were made directors, while Joseph Bakri Kup was appointed secretary. Yet the IPA change of directors form (see document below) was not completed until 29 October 2015, and is stamped by the Registrar, 29 June 2016. The form notifying the Registrar of Kup’s role (see document below), was not completed till 25 October 2016, and is stamped by the Registrar, 2 November 2016. With respect to the latter appointment, in the form submitted to the IPA, Kenneth Harvey declares as true that Joseph Kup assumed the secretary role on 25/01/2016, despite the fact he signed a company resolution over five years earlier appointing Kup secretary. Harvey, Beattie and Kup are among O’Neill’s closest business associates. Harvey also sits on the board of Air Nuigini (a Graphos client) and its subsidiary Link PNG, while Beattie has been a partner in the Pacific Legal Group since 2000 and is involved in many companies linked to the construction and mineral industries. 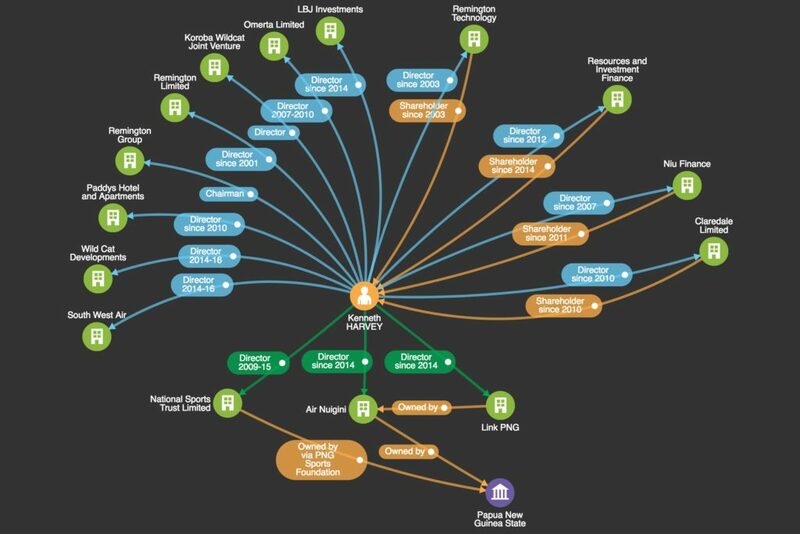 Network Graph: Kenneth Harvey’s corporate network and ties to O’Neill entities. 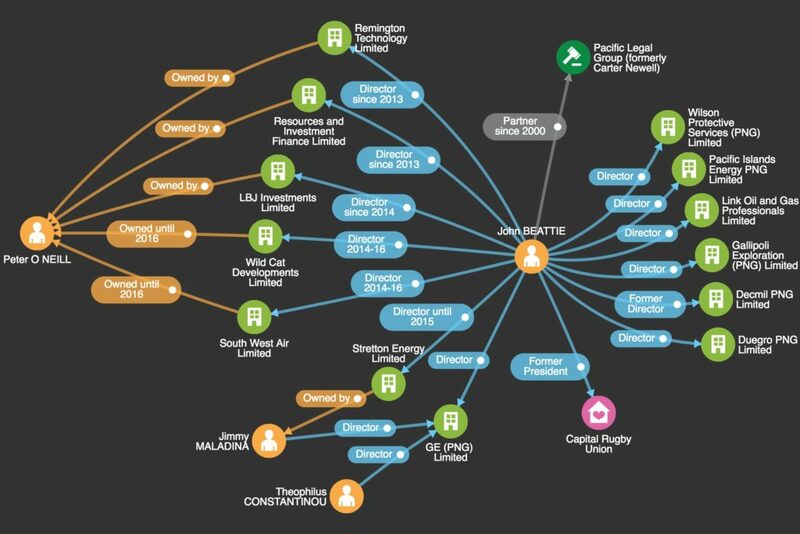 Network Graph: John Beattie’s corporate network and ties to O’Neill entities. As reported in the Midas Touch, Kup worked as Mecca No.36 Limited’s accountant in 1998 – an alleged O’Neill entity – and was the company secretary from January 1997 to May 1998. He then moved on to another alleged O’Neill company, Port Moresby First National Real Estate. Subsequently, Kup acted as an accountant in many of O’Neill’s business ventures. 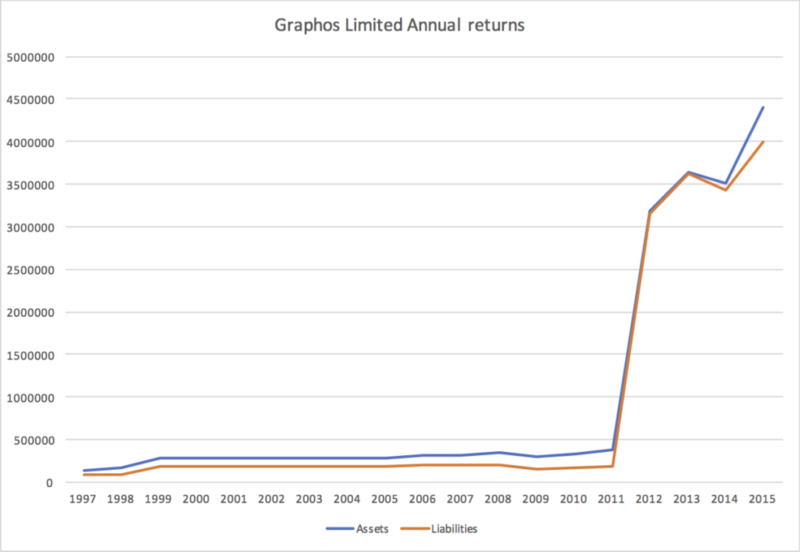 Adding to this rather strange case, in 2012 Graphos Limited submitted two Annual Returns for 2011. One, dated 28 June 2012, is signed by Kenneth James Harvey, and declares as true that the company has assets of K1.88* million, and is owned by Remington Technology Limited, while its Board consists of Harvey and Beattie. Just two days before, Brian Rice completes an Annual Return for Graphos Limited also covering the 2011 period. Except this Annual Return claims as true that the company has assets of K384,538 and is owned by Brian Rice and Joe Naipu, who are also the directors. Absent from the Annual Return is mention of Remington Technology Limited, Kenneth James Harvey, or John Donald Beattie. Under the Companies Act 1997, any person who knowingly allows a false or misleading document to be submitted to the Registrar is guilty of an offence under s413(4). Given the discrepancies in these two Annual Returns, both evidently completed in June 2012, this matter requires further investigation. *When Remington Technology Limited purchased the company, there is a notable spike in stated assets and liabilities. It would appear from the evidence presented here that a company owned by the Prime Minister has potentially committed a number of offences under the Companies Act 1997, which had the effect of concealing his beneficial stake in the firm, at a time when the company was in receipt of government contracts. Two clear courses of action are now required in light of this evidence. The Ombudsman Commission should investigate whether Peter O’Neill has included Graphos Limited in his annual statement of interests, and from what date.